The International Union for the Conservation of Nature (IUCN) has recently declared that threats facing orangutans in Borneo are considered so great that they are on the brink of extinction, a predicament worse than had originally been believed. The number of orangutans in Borneo has fallen from 288,500 in 1973 to 100,000 today and is predicted to shrink to a worrying 47,000 by 2025. This is the first time in many years that conservationists have had a clear understanding of population trends amongst orangutans. The main cause of this is the loss of habitat, however other factors include hunting and the slow reproductive cycles of orangutans. It is considered that orangutans are dying out so fast that it will be extremely difficult to reverse the prospect of extinction. 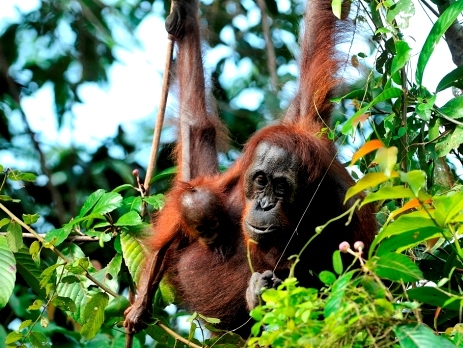 Orangutans in Borneo are losing their habitat at a startling rate each year. Some of the world’s largest and oldest rain forests can be found in Borneo, however this ecosystem is fast being torn down for palm oil plantations, to create space for coal mines and to gather precious timber. Money has certainly become a driving factor in this tragic habitat destruction, and as communities and individuals become ever richer, it is increasingly difficult to turn the tide on this practice. When the orangutans lose their habitats, they also lose their food source and their homes. Because of the rapid deforestation, this means that orangutans and humans are now living in very close proximity to one another – and adult orangutans that range into the plantations are inevitably killed, as they are considered to be pests. If a baby orangutan is found in the plantations however, it will be captured and sold in the illegal pet market. The small islands of orangutans that are ensconced by the plantations are often unable to move elsewhere, which creates a great risk of inbreeding. It has been calculated that about 2000 – 3000 orangutans are hunted each year, sold off for their body parts or consumed by local communities. Orangutans are also taken from the wild to be sold into the illegal pet trade, and it is estimated that about 200 – 500 orangutans are illegally traded each year, with baby orangutans fetching several hundred dollars in markets on neighbouring islands. The orangutan has the slowest development of adulthood in the world, and mother orangutans will wait about 7 years between offspring before having another baby. Female orangutans will usually have their first baby between the age of 11 and 18 years of age, which is considered very late in comparison to other species. Mother orangutans are usually pregnant for about 8.5 months, and once born, their babies will stay with their mothers and suckle from them for 3 – 4 years; they generally stay with their mothers until the age of about 8. During these early years, the baby orangutan learns from its mother where to find food, what to eat, how to build nests to sleep in, how to get around the forest and how to avoid enemies. This learning process becomes ever more difficult when the habitat is slowly diminishing – even more so given that female orangutans prefer to stay in their own territory even if trees are being cut down and they can no longer find food or shelter. The threat facing orangutans is so large that it needs action from many different strategies. Here at Oyster Worldwide we try to do our small part by enabling volunteers to head out to Borneo to help replenish the rainforests, and monitor the health and well being of the orangutans living in the wild. Not only does this project directly help the survival of the orangutans in their natural environment, it also enables volunteers to spread the word about the plight of this remarkable creature, and hopefully raise further awareness when back at home. 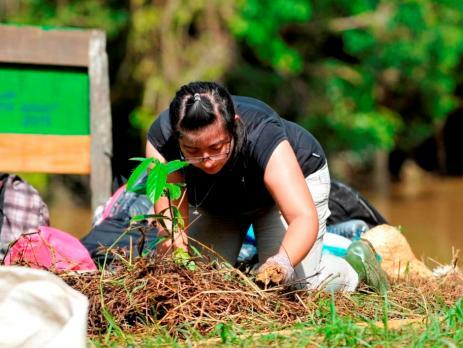 Find out more about what you can do to combat the threats facing orangutans on our Borneo wildlife conservation project and our Malaysian orangutan volunteering project.